Gabbro is a coarse-grained, plutonic igneous rock that forms at spreading centers in rift zones and mid-ocean ridges (so underlies oceanic crust). 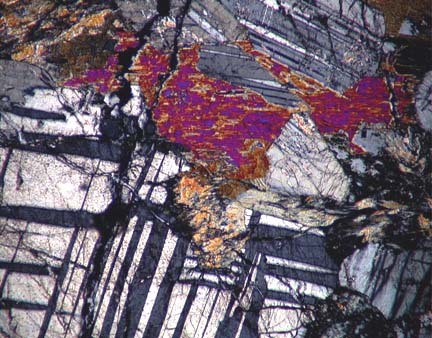 Gabbros can form as massive uniform intrusions or as layered ultramafic intrusions formed by settling of pyroxenes and plagioclase (pyroxene-plagioclase cumulate). 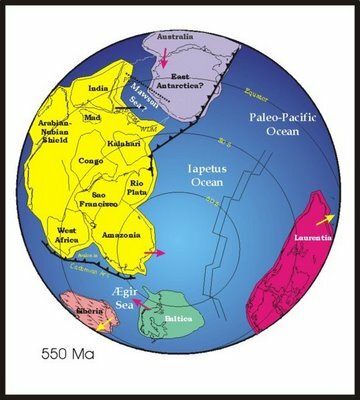 As an essential component of the oceanic crust, gabbros are found in many ophiolite complexes in the sheeted dyke zone to massive gabbro zone (zones III and IV). Long belts of gabbroic intrusions are typical at proto-rift zones and around ancient rift zone margins, where they intrude into the rift flanks. Gabbro is a dense rock that is greenish or dark-colored and comprises varied percentages of pyroxenes, plagioclase, amphiboles, and olivine. Where olivine is present in large quantities, the rock is termed olivine gabbro. A finer grained rocks with the same composition as gabbro is termed diabase. Granite is typically a medium to coarse grained felsic, intrusive igneous rock (plutonic) that is usually pink to dark gray, sometimes black, depending on its chemistry and mineralogy. Granites are the commonest basement rocks of the continental crust, many dating from the Precambrian. In some granites, individual crystals are larger than the groundmass (porphyrys). 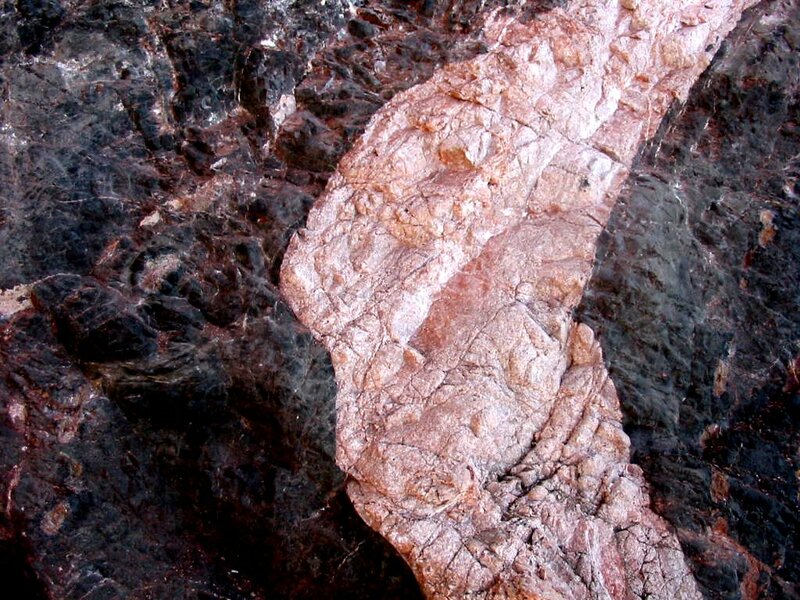 Granites primarily comprises orthoclase and plagioclase feldspars, quartz, hornblende, muscovite and/or biotite micas, with minor accessory minerals such as magnetite, garnet, zircon and apatite. Rarely, a pyroxene is present. Very rarely, iron-rich olivine, fayalite, occurs. Granites are classified according to the QAPF diagram for granitoids and phaneritic foidolites (plutonic rocks) that compares the percentages of quartz, alkali feldspar (orthoclase, sanidine, or microcline) and plagioclase feldspar. 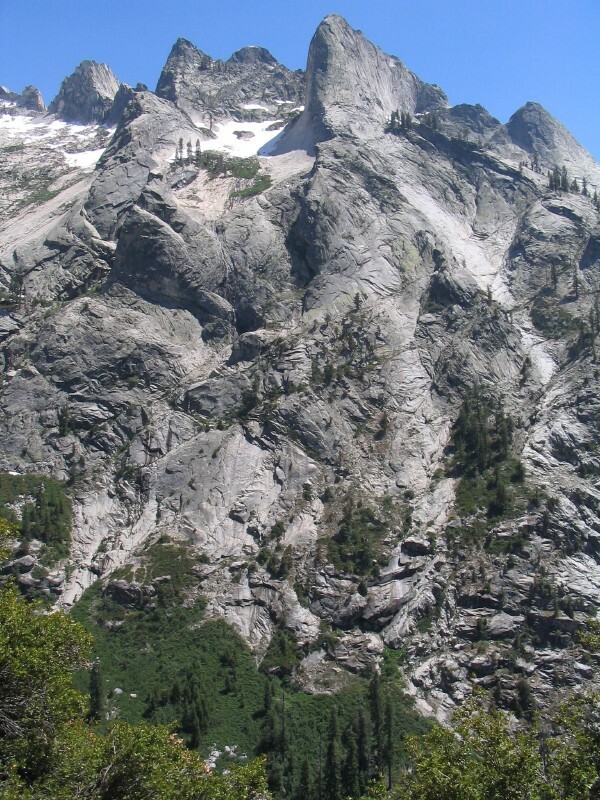 As a plutonic rock, granite is often exposed in weathered tors, dykes and as massive batholiths.